Okay, it's a bit of a reach from the James Joyce classic, but the tale of Big Canoe artist Bob Glover is best told with a sketch Or several sketchbooks, as the case may be. Sketching is where the artist's mind can run free and play as a springboard for interpretations to come. For years Bob carried a sketchbook with him, waiting and ready for any interesting scene that happened to come his way. 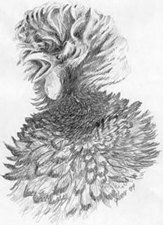 But it wasn't until a serendipitous circumstance in 2004 when a lady at an antique show studied Bob sketching away and commissioned him to do a series of drawings of "Extraordinary Chickens" that Bob re-entered the world of expressive art. Now Bob was truly "born" an artist, but his talent took diverse turns as his career unfolded. 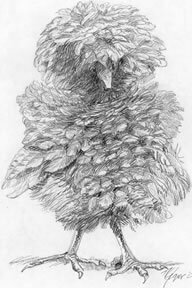 As a teen, the National Audubon Society published a few of his drawings and that's when young Bob knew he had found his life's work. It was a correspondence course form the Famous Artists School in the late 1950s that really set Bob on his course. The Famous Artists School taught techniques and skills, but also encouraged hopeful budding artists to express their own talents and imaginations. Bob later graduated with a degree in fine arts from the University of Georgia. Bob early learned about the creative side of life. His dad ran a commercial printing shop in Waynesboro, Georgia and it was there young Bob learned design techniques necessary for good layout. Before (finishing) college he worked for the Georgia Forestry Commission where he designed their publications and did graphic design work. He also worked for the first PBS station in Georgia as a student art designer. Talk about being transported in time and space! 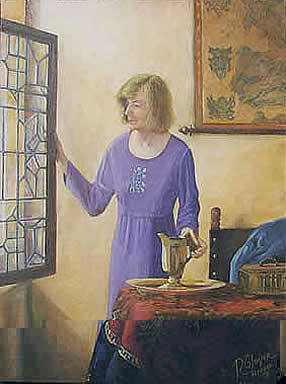 Artist Bob Glover placed his wife Lynne in a 17th century Dutch home is a pose depicted by Johannes Vermeer in Young Woman with a Water Jug. extensive travel, which Bob used as a reason to visit museums, exhibits and galleries all over the United States and Europe. His sketchbook was always in hand, reflecting Bob's credo that sketching is critical for an artist who paints. But it was the chance encounter with a chicken lover in 2004 that allowed Bob to return to the artist within. Ever since, he has drawn and painted what he loves. At first his passion was landscapes. Not passive landscapes, but ones where the earth comes alive for the viewer. Bob doesn't just paint a scene, instead he combines many views from another time or place, to create an interpretation of what might be visualized. Tricky stuff but very impressive. Lately, Bob has turned to a new form of expression, interpretations from old movie scenes, particularly old westerns. Many of his pieces have been on exhibit at the Booth Western Art Museum. Of special note is his large oil painting Adams Ranch, which depicts the opening and final scenes of True Grit. Bob and his wife Lynne have lived at Big Canoe for 10 years. He has been a member of the Big Canoe Artist's Club for four years and the word is, he just might be president next year. 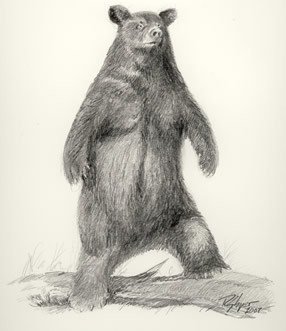 Recently Bob donated a pencil sketch of a bear to the Wing Ding auction. Bears, chickens, mountains, streams ... Bob Glover can paint and interpret most anything. Check out this hometown artist for his view of the world, and then be prepared to enjoy the scenery. 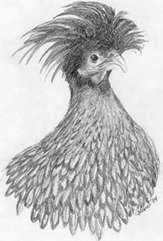 The following drawings are studies of photographs from Extraordinary Chickens, a book of photographs by Stephen Green-Armytage (.Harry N. Abrams, publisher : ISBN: 0-8109-3343-8). They are linked to an additional drawing in the series done for a client.